Beginning in the 1960s, research began to emerge that some forms of saturated fat can increase blood cholesterol. In general, saturated fat became feared as a major cause of heart disease, clogging our arteries and killing us slowly. Coincidentally, at that time, the farming and production of soy products domestically was becoming a huge industry and the American Soybean Association was seeking to eliminate imported tropical oils from the market. By the 1980s, the government and media jumped on the bandwagon against coconut oil and vegetable/canola oil became the “healthy” choice. As a result, our products changed and we were no longer getting the nutritional benefits of coconut oil in our food. Since that time, our nation has actually seen an increase in heart disease, cancer, diabetes, and obesity. How do you decide what to believe when it comes to your health? This is the ultimate question I get when I tell people I write a wellness blog because there are so many contradictory opinions and “facts” out there. Since I seem find myself always going against the grain on what’s generally accepted as healthy, I have to explain my rationale a lot. While there’s much more that plays into my beliefs, it usually comes down to this: look at the facts and the research, but focus on the sources. Personally, I am less likely to believe information coming from a medical journal published by a pharmaceutical company or a government recommendation based on profit to the economy. Often, the source of the information really sheds some light on possible motives involved in the dissemination of that message. For example, compare the likely credibility of a doctor who supports some drug and just happens to make lots of money from said support versus the doctor who is standing up against their institution and risking losing their job or research funding because of it. While it may seem like a dramatic example, I find it all too common in my research. Okay, back to the topic at hand: enter our current world of everything canola oil and a country dying of chronic illnesses. The Coconut Oil Miracle opened my eyes to all the health benefits the fruit has to offer – it’s pretty amazing and we’ve really been missing out. What I loved about the book is that it uses research based on real cultures: “Coconuts (and coconut oil) have been used as a major source of food for thousands of years by millions of people in Asia, the Pacific Islands, Africa, and Central America. 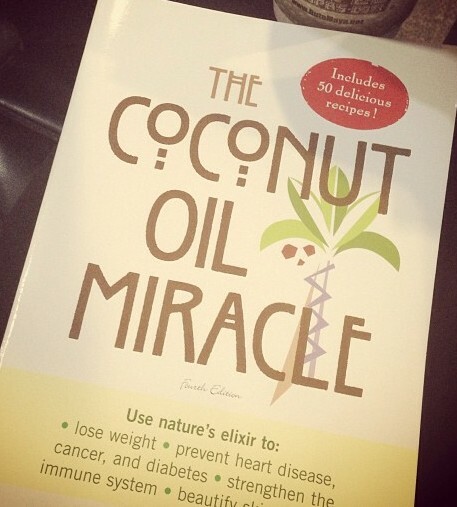 Traditionally these people have had much better health than those in North America and Europe who don’t eat coconut.” The book also explains the science behind why the fat in coconut oil is so beneficial to us. The main reason it’s so beneficial is that it’s comprised of medium-chain and short-chain fatty acids, which our body breaks down for energy rather than storing as fat like the long-chain fatty acids in vegetable oil. Let’s talk for a bit about free radicals. Free radicals cause cellular damage as they seek to steal electrons from other molecules, causing a chain reaction creating more free radicals stealing electrons. They attack our cells, causing damage and mutations. Ultimately, they cause degenerative diseases like cancer, heart disease, and diabetes, failing memory, reproductive problems, aging… the list goes on. We encounter free radicals throughout our environment and some occur naturally so they cannot be completely avoided, but many of the additives and toxins in our food promote their destruction. It’s important to limit your exposure to free radicals and incorporate antioxidants into your diet as they’re the only way to stop them. Vegetable oils contain a high amount of free radicals because they are chemically unstable and oxidize so easily. Coconut oil, on the other hand, contains none of these and also helps fight the ones you experience in your environment by giving you a boost of antioxidants, plus it’s safe and still beneficial after heated during cooking – a rarity among oils. “By far the best and richest natural sources of lauric acid are coconuts and coconut oil.” Lauric acid kills lipid-coated microorganisms like HIV, measles, herpes, influenza, leukemia, hepatitis C, staph, and strep, just to name a few. The medium-chain fatty acids (MCFAs) in coconut oil work for our immune system just like they do for newborns from a mother’s breast milk. MCFAs kill bacteria that causes a multitude of STDs, staph, food poisoning, meningitis, ulcers and sinusitis. They also defend against parasites that can cause food allergies and chronic fatigue. The vegetable oils that you consume attack your thyroid and make you fat. Replacing those oils with coconut oil, which adds MCFAs to the mix and increases your metabolism, can actually help you lose weight. Coconut oil is considered a catch-all healing medicine in many countries, helping with digestive issues, nourishment to newborn babies, osteoporosis, chronic fatigue syndrome, cancer, diabetes and liver disease. So how can you incorporate coconut oil into your diet and routine? The book recommends 3 1/2 tablespoons daily… you can cook with it (replace any oil with it, same amount), put it in your coffee (if you love lattes, check out this amazing recipe), or use it on your skin. You’ve got to put this book on your reading list… it’s such an easy read and there is so much more information and case studies that will really amaze you. Will you give coconut oil a try? Let me know what you think… I’m hoping you all become just as obsessed as I am! Source: The Coconut Oil Miracle written by Bruce Fife, C.N., M.D. So funny you just wrote a post about coconut oil. I just got some recently to try ‘oil pulling’. I am really looking forward to trying some of the things you mentioned! Great – I’ve been doing oil pulling recently and some research about it that I hope to share soon! Curious to know if you see results! Keep me updated!